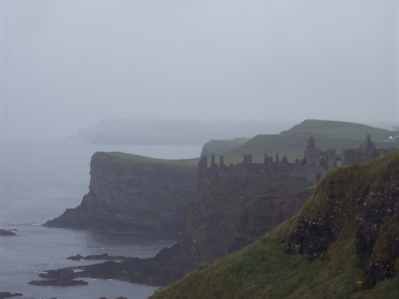 My trip to Ireland was based mainly on a mysterious prompting I saw in the ocean last summer, and even as I boarded the plane to fly to Dublin, I was unsure as to the purpose of my trip to the Emerald Isle. Upon arriving in my first destination, Ballybunion on the western coast south of the river Shannon, I had an inkling that I would enjoy this flower poaching business. 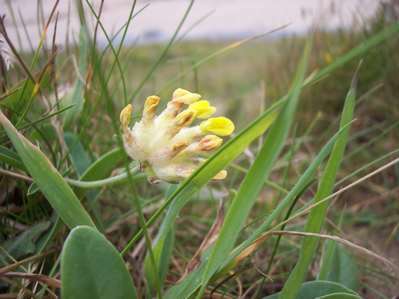 I spent an hour searching the beaches, nestled between Ballybunionâ€™s world famous golf course and the Atlantic, for Kidney Vetch, the first flower on my list. With my tee time quickly approaching and no sign of Kidney Vetch anywhere (***Kidney Vetch*** â€“ VERY IMPORTANT!!!!) I paused to think about turning around and formalizing an excuse for returning to New Hampshire without one of Green Hope Farmâ€™s must haves. It was at that moment that I looked to my feet and spotted a single blossom of what I was sure was Kidney Vetch, suggesting that it is not always the Green Hope Farm worker who finds the flower, but often the contrary. With that, I sensed a purpose for my Kerouac-esque journey. My trip in Ireland took me along the western and eventually northern coast of the island, through pockets of relatives in and near Clifden, into ancestral Oâ€™Toole territory on the ancient and tidal Omey Island, by (London)Derry and to the Giantâ€™s Causeway near Portrush. 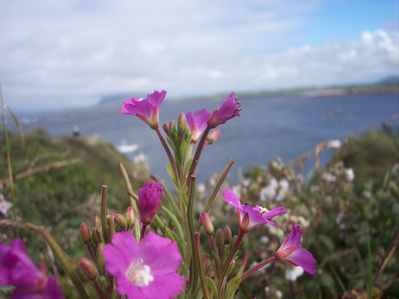 I collected flowers along the way, including two from a town called Spiddal. While I wandered the rocky beach in Spiddal, I had an uneasy feeling, and was not sure any flowers I collected would offer beneficial vibrations. Upon returning to New Hampshire, I had a fitful night of weird dreams in which I was driving towards Spiddal, where I was to be burned at the stake for unclear reasons. 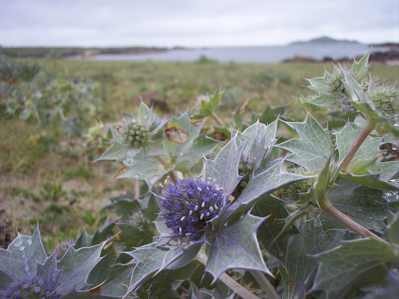 These dreams clarified my uneasiness in Spiddal, and offered an explanation for the flowers that I had picked during my strange night in that little coastal town. Somehow I had tapped into a past life experience, and the flowers on that rocky beach understood how to navigate such a jarring and inexplicable sentiment. During my trip I felt a pervasive sense of depression across the land, highlighted by news reports of roadway deaths and economic gloom. Topics of conversation often included those already passed or those soon to, and for an upbeat American guy, the psychological climate was unsettling. Some called it â€œFamine Mentality,â€ and to this point, Ireland has lost millions of citizens in the last 150 years to death and emigration. Many of those who left were searching for a life with opportunities; opportunities that were unavailable in the Ireland of the 1870â€™s and 1910â€™s. A number of the flowers I brought back are helpful in protection against an overwhelming sense of sadness and loss. The island feels haunted by loss, both in the ether and on the sides of buildings: the Bogside murals below the Derry city walls depict victims of the Troubles for all to see. Above all else, the Irish flowers I collected are about perseverance, whether dealing with loss, difficult connections to the past, or simply gray days with too much rain. The names are both mysterious (Bofin Unusual) and epic (Giantâ€™s Causeway.) The places they represent run the gamut from cliff-side in North Ireland, to beach-side on Omey, to middle of nowhere gathered during one of my excursionary boondoggles, of which there were many. What has been so fascinating for me growing up around my Mother’s business is that often essences take on unexpected personalities because of customer reactions to them. I will look forward to learning about these essences through your collective eyes. It’s looking like a real vineyard out there, but the head of the vineyard (someone we will call eldest son B) has told me that he is “not ready” to make vino this season. I do not know what technical problem holds up his process. We all suspect he does not think our feet are clean enough. In any case, in the face of this delay, I wish I could give my shoulders a gallic shrug and say, “There will always be next year’s vintage.” but I have a serious case of garden guilt, and this precludes any sort of relaxed response to eldest son B’s laissez faire attitude about the grape harvest. My garden guilt means I find it painful to waste anything the garden throws at us, except for maybe zucchinis. So yesterday, I looked at the rows and rows of ripening grapes, the product of many years of eldest son B’s pruning and many hours of Sophie, Emily and me on our hands and knees weeding the small vineyard for eldest son B…. and thoughts turned to grape cookery. First it was necessary to wipe the last peach froth from our moustaches, because the last two weeks has seen us wallowing in peaches morning noon and night. For days we waddled back and forth to the peach trees, wearing our peaches on our hips and lips, garden guilt driving us to new heights of peach creativity. It was Top Chef all over again as we had peaches in drinks, soups, salads, main courses, and dessert. Why, even the dogs were dining on peaches. While usually it was just peaches for their breakfast, one day I treated them to a big slice of leftover peach kuchen, because there was another hot peach pie waiting for the humans. But last night, as the peach harvest began to slow, it was grape time and I had one of my Sisyphus like ideas to make a GRAPE PIE. Perching myself in front of Man vs Wild’s Bear Grylls with various children rooting me on, I figured I would pass the time pleasantly while Bear fought crocodiles in Northern Australia. An hour later as Bear Grylls broke through a tangle mess of mangroves to civilization, my heroic efforts had garnered us a 1/2 cup of grape skins and arms covered in sticky grape juice. We broke for dinner which at this point in the summer is gazpacho and more gazpacho because really, just how many red currant cherry tomatoes can one pop in one’s mouth- at some point they have to be blenderized just to simplify the eating process. 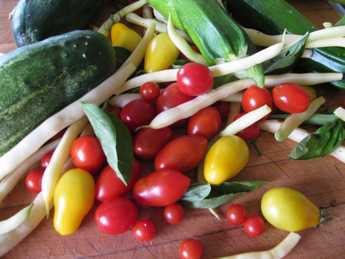 Plus gazpacho is great for garden guilt as it’s a great way to use abundant cukes, garlic, and peppers (and real he man tomatoes if you have them). Two hours hard labor after dinner and STILL the bowl only had about four cups of grape skins. It was time to just make the pie and have it be a slender but delicately undernourished thing ( the only thing around here that could claim this). My first and only GRAPE PIE came out of the oven at ten and people were frankly too exhausted by the process of watching me de-seed grapes to even try her ’til this morning. Pie for breakfast has sort of gotten mundane around here, but this morning her loveliness drew people in. 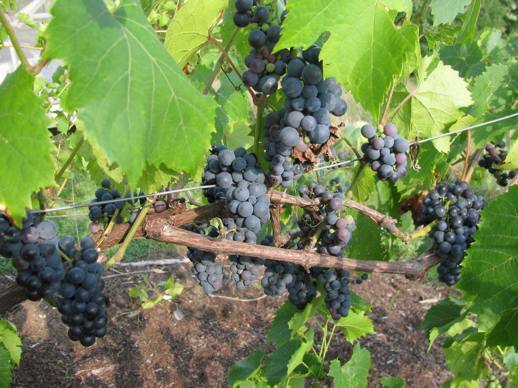 Don’t be fooled by this close up, those grapes are smaller than they look- But who’s complaining? 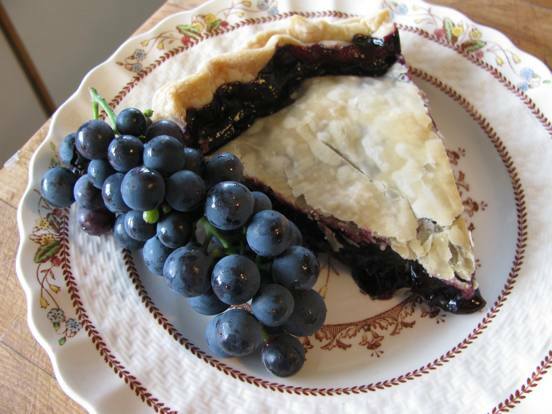 She was delicious, tasting a lot like ……….blueberry pie………which means I have now officially sworn off ever making a Grape Pie again. Eldest son B is out of town this week. Sadly this means he may never ever taste Grape Pie unless he battles grapes seeds in his own four hour de-seeding marathon. Funny how I can manage a gallic shrug about that! 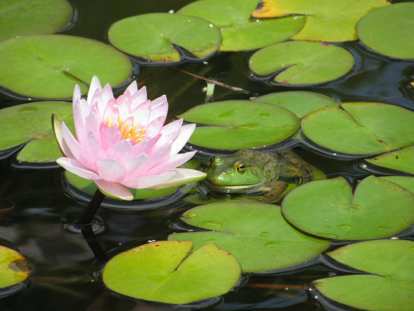 Right now we are particularly enjoying our Monet lilies, because our resident frog has become quite a character. Morning , noon and night he holds court in the pottery bowl fountain in the small pond outside our office. We hope one of us is going to see how he gets in and out of the bowl. 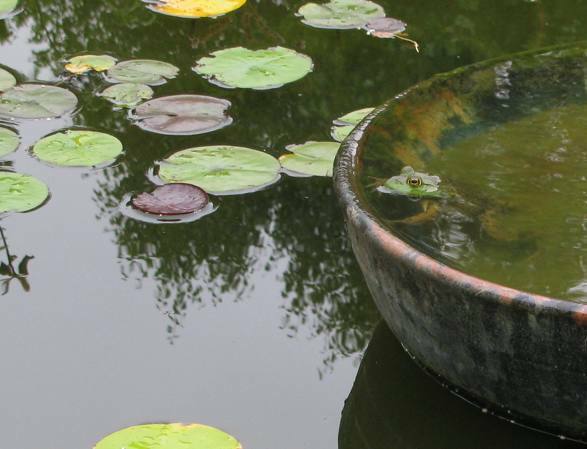 Does he leap from the edges of the pond? Does he clamber up the sloping sides of the bowl? How on earth is he coming and going from his castle? It’s amazing how much pleasure one saucy frog has given us. Our pottery bowl runneth over! This summer has been a whirlwind of activity. This week Jim, Will and Ben jacked up the building where we dry the Red Shiso, the plant we use as our Flower Essence stabilizer. They then rebuilt its foundation and cleared out much of the brush that had made a visit to the Red Shiso barn something akin to a visit to Baba Yaga’s hut built on chicken feet. Apparently the building practically was built on chicken feet, and it was a lucky thing it didn’t sail right off its old foundations when we were in it. The building tipped down hill 8 inches on its old foundation but is now plumb, square, level and ready for this year’s crop of Red Shiso. Inside the office, Emily and Jess finished designing the new logos for the Flower Essences Emily made in Sicily and Santorini this spring. We all love the logo with its soft warm colors and view of Cefalu, an ancient city on the north coast of Sicily. We plan to take this whole collection of Mediterranean Flowers forward right after the autumnal equinox, always a great time to launch new Flower Essences (This also works for me because it’s difficult for me to get major inside projects done during the growing season!). At the equinox, we will also be officially introducing the new ones I made here at the Farm this summer and the new ones Ben made in Ireland. During Ben’s recent trip to Ireland, the Irish Elementals took him all the way around the western and northern coast of Ireland to make Flower Essences from beloved old Flower friends like Ladies Bedstraw and many new Flowers as well. I have asked him to guest blog about his adventures. As with last trip, his cousin Roisin helped find the Flowers as well as put Ben through his paces in an arctic swim off the magic island of Inishbofin. Thank you Roisin! We have been wonderfully busy inside the office as well as outside. So many new folks are finding us, and we have been sending more Essences out into the world than ever before. With the energies of the world so erratic and overheated, I am so glad that so many are finding Flower Essences for themselves and the animals in their lives, since Flower Essences offer such helpful information about handling these fiery times. Our work with rescue animals continues to give us all so much joy and we have been sending Flower Essences to so many different species of animals from goats to elephants. Elizabeth is in the final stages of cover design and final proofing of her book on her walk across the Camino of northern Spain in the summer of 2008. This book has taken the better part of two years work for her. I have read it at least ten times in all its many drafts, and I am crazy about it. I can’t wait to share that with you too, later this fall! 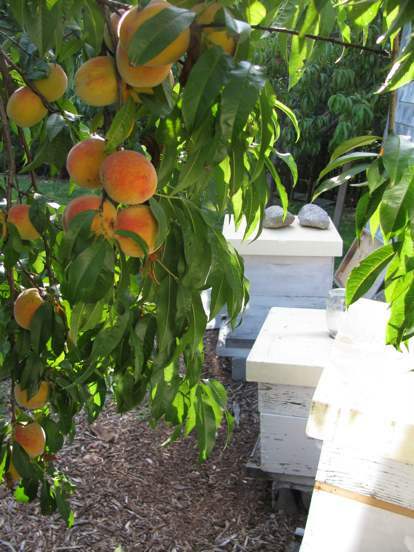 But today is Friday, which means I am off to work in the gardens…….with a first stop for a visit with the bees and a snack of one of the luscious peaches hanging overing the hives right now. It’s one of the good things about having gardens and lots of ’em. Everyone can indulge in their obsessions and sometimes no one else notices for quite awhile. 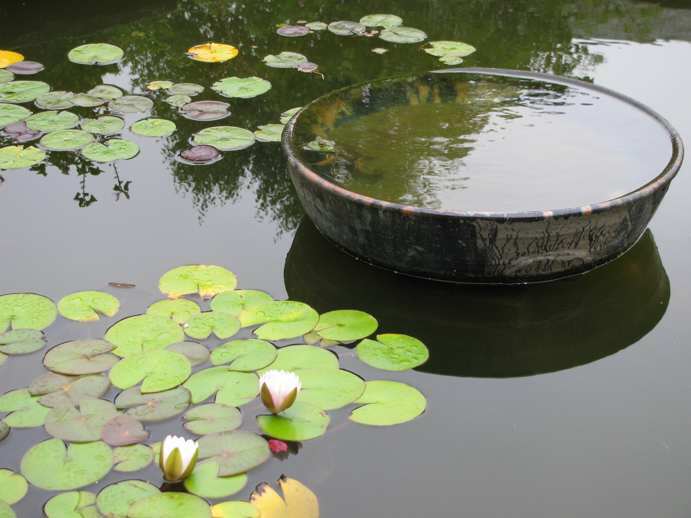 For example, it took Reina’s obsession with the enormous frog in the koi pond for us to notice the frog had an obsession of his own, this lovely Pink Water Lily. The clock is ticking (quite literally) on Ben noticing my obsession with petite vegetables. Just back from Ireland with dozens of Flower Essences and a good many funny stories, he has taken up the helm of the GHF kitchen. This afternoon, he wanted me to bring in all the tomatoes so he could make a pasta sauce for tonight. Do you think he will notice my obsession with miniature vegetables when he learns that my description of having found a couple dozen tomatoes for him was sort of misleading? 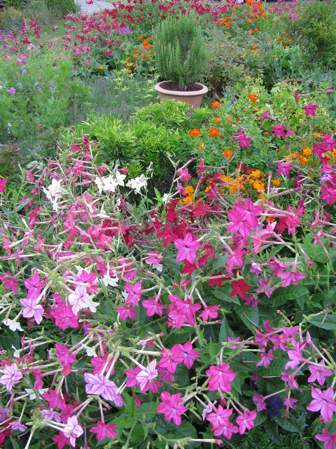 My obsession with different varieties of Flower Tobacco is bringing more pleasure. At least to me. And this may be good since I might be banished out to this garden to eat worms. Soon. But really, the obsession I wanted to discuss today is Jim’s. 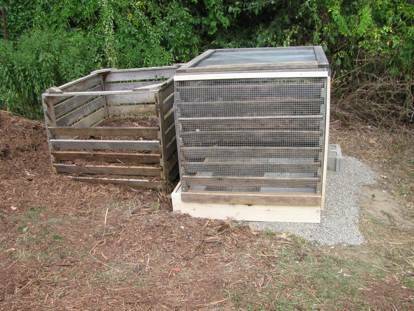 He disappeared about two days ago down to the compost structure we use for kitchen scraps. Its been a losing battle to keep every animal in a five mile radius out of this bin. Riley in particular has a penchant for disappearing right after someone has taken a juicy compost pail down to the bin, only to return a few hours later with bad breath and a serious need for Digestive Woes. Unmodified structure on left. Bastille prison on right. Good luck to all garden patriots. I will be up at the house sharing a festive meal of an 1/8 cup of pasta sauce with Ben and the rest of the fam. If they’ll have me.